This is a major news story. Ever since the 9/11 attacks on America, Pakistan has carried the brunt of US harsh war policy in the AfPak region. The ties with the US has deteriorated ever since, also under the Obama administration. Harsh criticism by president Trump and threats has separated the two nations even further. In the meantime US relations with Saudi Arabia has created a new alliance with Israel to the detriment of the Palestinian people and its UNRWA refugees. Iranian Foreign Minister Javad Zarif called on Prime Minister Imran Khan on Friday at the PM House with both sides underlining the need to promote bilateral relations in all areas of cooperation. PM Khan said Pakistan and Iran were the key to growth and prosperity in the region through enhancing connectivity and promoting people to people linkages, Radio Pakistan reported. The prime minister thanked the Iranian Supreme Leader's support for Kashmiris struggle for self-determination. Zarif delivered a message of Iranian President Hassan Rouhani, inviting the Prime Minister for the upcoming Asian Cooperation Dialogue Summit in Iran in October this year. The Iranian foreign minister, who arrived in Islamabad on Thursday for a two-day visit, earlier held detailed talks with his Pakistani counterpart Shah Mahmood Qureshi. Pakistan's Foreign Office had also expressed concern on US's withdrawal from the Iran nuclear deal, saying that the decision would affect the world community's efforts to solve the "conflict" with Iran. During the talks on Friday, Qureshi "supported Iran's principled stance" and expressed the hope that remaining parties to the Iran deal would uphold their commitments. The foreign minister, according to the press release, reiterated that Pakistan stands with Iran "in this hour of need". Qureshi stressed that Pakistan greatly values Supreme Leader Ayatollah Ali Khamenei's "strong and unswerving support for the just struggle of the people of Kashmir". Zarif, meanwhile, congratulated Qureshi on "Pakistan's strong protest against the blasphemous caricature competition had led to cancellation of the event". FM Zarif also called on Chief of Army Staff (COAS) General Qamar Javed Bajwa at the General Headquarters in Rawalpindi. According to Inter-Services Public Relations (ISPR), regional security situation and other matters of mutual interest were discussed. The army's media wing said the visiting dignitary "acknowledged and appreciated Pakistan's contributions for conflict prevention in the region". Iran has been warming up to Pakistan after remaining lukewarm for decades and potentially sees its neighbour as part of the emerging regional bloc that could include Russia and China. 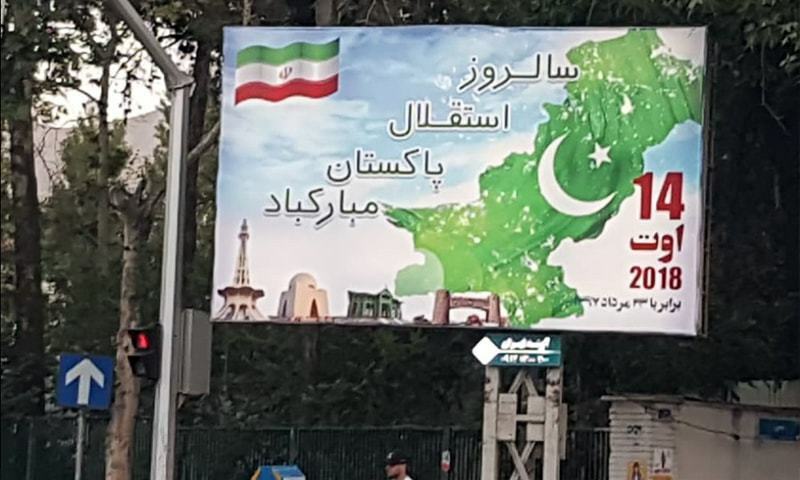 Iran this year celebrated Pakistan's Independence Day in an unprecedented manner, displaying large greeting hoardings along major highways in Iranian cities. The Iranian FM's trip comes ahead of US Secretary of State Michael Pompeo and Chairman of the Joint Chiefs of Staff Committee General Joseph F. Dunford's visit to Islamabad next week for talks with their counterparts. Recent US law called CAATSA -- Countering America's Adversaries through Sanctions Act -- deters countries from buying Russian weapon systems. Pakistan has lodged a strong protest with the Netherlands over a Dutch politician's announcement of holding a competition of blasphemous caricatures. "The charge d'affaires of the Kingdom of the Netherlands was summoned to the Foreign Office on Monday and a strong protest was lodged on the announcement by the leader of the Dutch Freedom Party and Parliamentarian, Geert Wilders, to hold a competition of blasphemous caricatures," according to a statement issued by the Foreign Office. "Deep concern was conveyed at this deliberate and malicious attempt to defame Islam," it said.